Lustrous Hair: Vitaslim BEAUTY recovers damaged hair by hydrating and nourishing it from within. It fights hair loss by strengthening the bonds between scalp and hair roots. Vitaslim BEAUTY reduces dandruff through active nourishment and hydration of the scalp. It speeds up hair growth, and makes hair strong, elastic and resistible to chemical treatments, hot air from hair dryers, cold, sun, wind, etc. Strong Nails: Vitaslim BEAUTY strengthens soft and brittle nails. It speeds up their growth and improves their appearance, helping them become healthy and good looking. 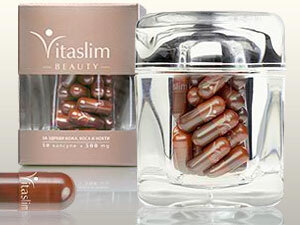 Toned Skin: Vitaslim BEAUTY nourishes and hydrates skin, making it elastic, soft as silk, and lustrous. The product slows down ageing and appearance of wrinkles by its strong antioxidant action. It improves the condition of epidermis, thus helping the skin recover faster and look younger and lively. Contraindications:There are no known contraindications. This product is not recommended for people allergic to fish products (fish gelatin capsules).